rec. Akershus Castle Church (Slottskirke), Oslo, Norway, 27-29 January 2015. DDD. Reviewed as 24/96 download with pdf booklet from eclassical.com and as streamed from classicsonlinehd.com and Naxos Music Library. Also available on DVD, with Adagio for violin and orchestra in E, K261.  Arthur Grumiaux (violin), LSO/Colin Davis (Decca 4383232, 2 CDs, Violin Concertos 1-5, with Sinfonia Concertante, K364, Adagio, K261, Rondo in C, K373 OR Philips 4647222, 2 CDs, with Violin Sonatas 32 and 35, with Clara Haskil). Still my go-to version. 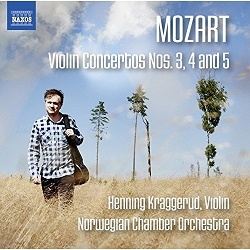  Simon Standage (violin); Academy of Ancient Music/Christopher Hogwood (Decca Oiseau Lyre E4557212, 2 CDs, budget price, Violin Concertos 1-5;Adagio and Rondo – DL Roundup August 2011/2) NB: Passionato link no longer applies. With so many distinguished recordings to cater for all tastes: modern instruments (Grumiaux and Kraggerud) or period instruments (the remainder of those listed), all five concertos or just the last three, this Naxos recording enters a very competitive market. It’s not even the only recording to be offered at budget price: both the Grumiaux and Standage 2-CD sets come as two-for-one and some dealers have the Carmignola for around £15. The crucial test with Carmignola and Abbado concerns the tempi for the slow movements. In the Adagio of No.1, for example, I know that some find that they miss the essence of the movement but if you forget all the other performances you may have heard there’s no lack of sensitivity and tenderness here. Grumiaux and Davis actually adopt a slightly faster tempo for this movement, while Faust and Antonini are only a shade slower. Of all the recordings of this movement to which I listened, Faust and Antonini’s balance between keeping this movement moving and capturing its beauty strikes me as one of the most successful. Standage and Hogwood give us a slightly more romantic and lingering view of the movement without overdoing it: that’s hardly surprising since Standage has a track record for bridging the traditional and authentic approaches to classical and earlier music. His Decca Originals recording of Vivaldi’s Four Seasons remains my favourite among recordings with modern instruments: he, Neville Marriner and the ASMF offer an account which still has the power to surprise. You could do much worse, then, than to choose the Decca Oiseau Lyre twofer for around £11.50. It can be downloaded in mp3 for £7.49 from 7digital.com , without booklet. Subscribers to Qobuz can stream it there and it can be downloaded in lossless sound for £10.26, again without booklet. I’ve already said that Faust and Antonini strike the best balance in the Adagio of Concerto No.1 and I’m now inclined to recommend that recent recording – recorded February-March 2016 – as my top choice among period-instrument performances. I listened all through without reaching for my red pen. As I write it’s available from Presto at a special price (£13.50 reduced from £15.75) and the 24-bit download to which I listened from eclassical.com is also available at the same price as mp3 and 16-bit ($19.37) as an introductory offer. It’s very well recorded, too, especially in 24-bit form: there’s no SACD, so that’s the only route to better-than-CD quality, and it comes with the booklet. The cadenzas are by Andreas Staier, who contributes to the notes in defence of their length. I never thought they outstayed their welcome. The five concertos and the shorter pieces on these complete recordings are such a delight that I recommend obtaining them all. If, however, you just want the final three it’s a straight choice between the very enjoyable Manze recording and the new Naxos. Manze and the AAM give us period performances that are far from dry and academic – I even found myself questioning a glaring rubato at the opening – while Kraggerud and his Norwegian team reciprocate with modern-instrument performance worthy of comparison with Grumiaux and Davis yet maintaining a sense of period practice. There’s no undue lingering in the slow movements, for example; if anything, traditionalists may find them a touch cool and lacking in tenderness: I didn’t. This album replaces the earlier Naxos recordings from Takako Nishizaki and Stephen Gunzenhauser with Capella Istropolitana, good though those are and perhaps still likely to be preferred by those who like a slightly more indulgent approach and the tonal sweetness of Nishizaki’s playing. (Nos. 3, 5, Adagio and Rondo 8.550418; No.4 and Sinfonia Concertante 8.550332). Subscribers to Qobuz, Naxos Music Library and classicsonlinehd.com will be able to make their own comparisons. The Adagio of No.3 would be a good test case: it’s loved almost to death by Nishizaki while Kraggerud, though somewhat more matter-of-fact, is certainly not unloving. Faust falls somewhere between the two approaches; she and Antonini keep the music moving but there is no hint of rushing things. One small grumble: if the Adagio K261 could be included on the Naxos DVD, why can’t we have it with the CD? There would have been room: it’s only about seven minutes long. More seriously, if you want the 24-bit version, the eclassical.com download at $17.89 is expensive for post-Brexit £UK purchasers who are better served by classicsonlinehd.com at £9.99. Both come with the booklet and both sound very well. No collection should be without some or all of these wonderful concertos, all composed at the age of 19, before Mozart left Salzburg. Overall my preference for Grumiaux and Davis on one of the inexpensive 2-CD sets is unshaken: whatever else you choose you should have one of these. The choice between the set with the sublime Sinfonia Concertante and that with Clara Haskil in the sonatas is hard to call. Either of the recent recordings from Faust and Antonini or Kraggerud and his team would make a very fine supplement. Choice between period and modern instruments and between the whole five concertos and just the last three would be a safe guide.